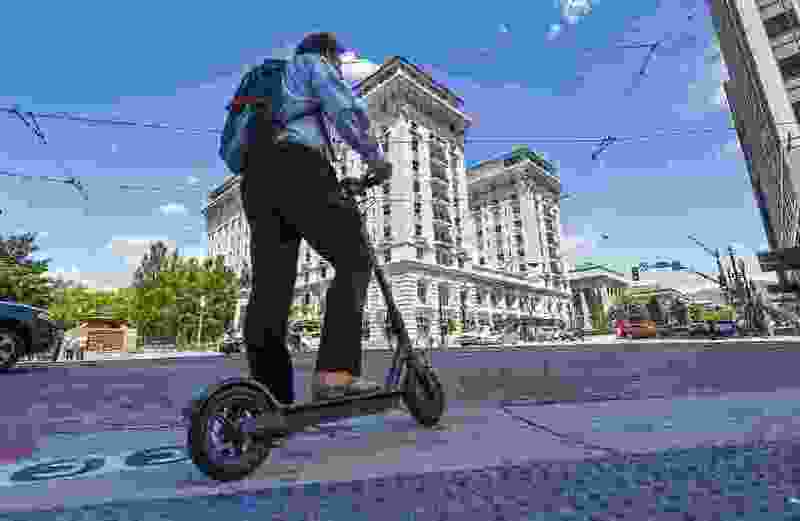 (Francisco Kjolseth | The Salt Lake Tribune) Brandon Urry, first time user of Bird, a dockless e-scooter company that aims to help people with the last mile of transit, catches a ride to his car on one of the recently dropped scooters in downtown Salt Lake City on Tuesday, July 3, 2018. Transportation experts, state legislators and Salt Lake City leaders on Wednesday discussed how to regulate the hundreds of e-scooters dropped onto downtown streets at the end of June. The state’s Transportation Interim Committee took a first chance to discuss the new transportation method, noting that some state laws complicate their use on roads with higher speed limits or more lanes of traffic. Creating new regulations will take time, acknowledged Gabriel Scheer, who’s the director of strategic development for the scooter company Lime. That’s because cities “haven’t necessarily been built” with electric scooters in mind, he said. Salt Lake City officials have created a one-year operating agreement to govern Lime and its competitor Bird, as well as similar businesses, but they are working to create a more formal ordinance, which could take several months. In the meantime, Scheer said, ridership has been growing exponentially since his company dropped its scooters on the streets two weeks ago. More than 10,000 people have ridden the scooters in Salt Lake City, and their average trip is about a mile long. Lime has seen its usage extend beyond Salt Lake City, from West Valley City to Millcreek, and the company may look at expanding operations into the valley, Scheer said. The Utah Transit Authority also expressed interest at the meeting in partnering with the scooters to provide people more options in bridging their last mile of travel. Salt Lake City officials told the legislative committee that the biggest problem they’ve seen is users riding on sidewalks, which is prohibited. “What I hope is that the sidewalk riding is more a result of people not yet understanding and being comfortable with that particular device and not understanding the rules of the road,” said Jennifer McGrath, Salt Lake City’s deputy director of community and neighborhoods. McGrath told the committee the city doesn’t know of any collisions that have been the result of sidewalk riding. But during public comment on the scooters, Salt Lake City resident George Chapman said he knows of pedestrians who have been hit. Jon Larsen, the city’s transportation director, said it’s been difficult to enforce sidewalk ridership rules. But while he noted that sidewalk riding is one of the “most complicated” issues the city and state face in regulation, Larsen offered ideas to address dissonance with state code, which prohibits scooter use on roads with posted speed limits higher than 25 mph or more than four lanes — descriptors that apply to many of the Salt Lake City streets where these scooters are being used. McGrath and Larsen recommended that legislators regulate the e-scooters similarly to bicycles, eliminating the four-lane restriction and bumping the speed cap up to 30 mph. If that cap didn’t apply to roads with a bike lane, that would eliminate many of the current restrictions and leave them in “places where it makes sense,” Larsen said. During the meeting, legislators asked Scheer and Chris Blake, a representative from Bird, a number of questions about how to use the technology, their business models and restrictions on use. Bird and Lime users must be 18 or older with a valid driver license and must bring their own helmets. The companies do not supply helmets. To take one of the scooters, a rider can download the company’s app to locate and unlock one. It costs $1 to rent, plus 15 cents per minute.